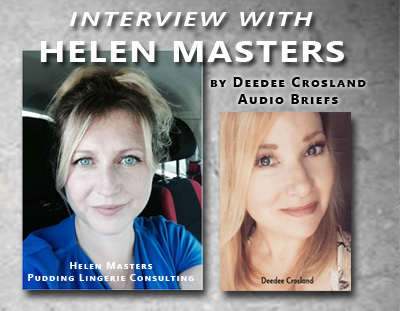 by DEEDEE CROSLAND ~ Audio Briefs I recently had the pleasure of chatting with Helen Masters, the owner and creator of Pudding Training and Consulting, located in Windsor, England. Pudding is a multi-platform lingerie consultancy firm that caters to retailers, brands and industry insiders all over the world. On this podcast you’ll hear how Helen transitioned from owning her highly successful, award winning lingerie boutique (Pudding) to establishing her training consultancy. Helen also talks about the fast changing retail climate, what the face of lingerie retail will look like in 5 years and how she helps brick and mortar stores compete with online retail. Take a listen and find out that the proof is indeed in the Pudding! Deedee’s love and knowledge of lingerie, her passion for storytelling and connecting with people through podcasts and video. AUDIO BRIEFS shares intimate and interesting interviews with industry pros that delve into the stories of what makes them tick. Also listen to inspiring and educational info about the world of lingerie and beyond. With more than 2 decades in the intimate apparel industry, Deedee Crosland has worked with global brands such as; Calvin Klein, Warners, Olga, Lejaby, Paul Frank, Yummie by Heather Thomson, Christine Silk, Simone Perele, Nina Ricci, Bedhead Pajamas, Knixwear and Fortnight. Throughout that time, her hats worn were as a – merchandiser, stylist, creative marketer, retailer, buyer, wholesaler and owner of deedeeandco. Deedee’s love and knowledge of lingerie, her passion for storytelling and connecting with people through podcasts and video lead to the creation of THE NAKED POINT OF VIEW.